A group of utility leaders, state agency representatives and political leaders learned Wednesday how energy deregulation has worked in other states. 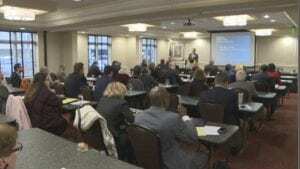 The South Carolina Small Business Chamber of Commerce hosted a public educational forum Thursday with utility and economic experts to address energy deregulation and how it could be applied in South Carolina. The expert panel presented case studies of utility deregulation in Texas, California, Illinois, Wisconsin and Georgia. Allowing utilities to compete for customers worked in some states, while in others, it didn’t. They explained why states such as Texas have been successful while California had to deal with rolling blackouts in 2000 and 2001. Knapp said utility rates are an issue important to the members of the Small Business Chamber of Commerce and the group has been monitoring them for years. “We have, for a long time, been trying to do anything we possibly could to keep electric and gas rates down for them. That’s why we’ve been involved in rate hikes since 2002, intervening to try to keep rate hikes as low as possible,” he said. Senator Tom Davis, R – Beaufort, has proposed a bill that would allow for utilities providing clean energy to be allowed to operate anywhere in the state. The Senate Clean Energy Access Act and the House Energy Freedom Acts are designed to allow companies who provide alternative energy sources to be allowed to operate in areas of the state already serviced by utility companies or cooperatives. “Hopefully it opens up the discussion of what Senator Davis is trying to say and that there is experience out there from other states that we can look to to see good ways of deregulating and possibly bad ways of deregulating,” Knapp said. “Let independent power producers go out there and compete and generate electricity on the competitive market and if you can generate power more cheaply, you ought to be able to sell that power to the grid and pass the savings onto the ratepayers,” Davis said. Knapp said the chamber has not yet decided if it will support Davis’ bill, but he said he wanted the decision-makers to be educated about energy deregulation when the issue arises.